What do you get if you ask a genre-defying producer, a classical composer, a raucous bluesman and Ravi Shankar’s daughter to produce the soundtrack to a movie which doesn’t exist? It’s a question which few would be inclined to ask and understandably so. Such a hodgepodge of collaborators have rarely – if ever – worked together before precisely because such a cocktail is so unlikely. 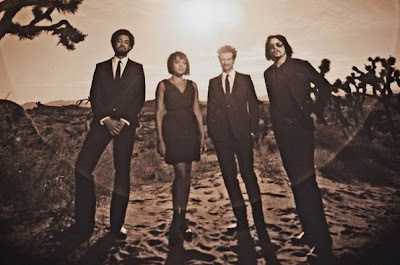 Yet remarkably Danger Mouse (aka Brian Burton), Daniele Luppi, and guest vocalists Jack White and Norah Jones have united to produce an album that is far greater than the sum of its disparate parts. Perhaps we shouldn’t be so surprised – after all, Burton did once fuse The Beatles with Metallica and has worked with artists as diverse as Beck, Gorillaz and U2. Owing a huge debt to Ennio Morricone’s spaghetti western soundtracks, Danger Mouse and Italian film composer Luppi have crafted a beautifully intricate yet sweepingly majestic collection of tracks which straddle the boundaries of film-score and pop record perfectly. It’s a sophisticated trick which has been pulled off with aplomb. The production is rich, detailed and imbued with an emotion which belies the fact that so many of the songs are instrumental. The surprising choice of vocalists proves to be anything but a gimmick. White is far from his usual shrieking self but still remains an eerily powerful presence as he lends his writing talent and fragile vocals to tracks like The Rose With A Broken Neck. Jones’ performance is still more surprising. Her voice drips like warm honey over Season’s Trees and Problem Queen, adding a counterpoint to White’s more fractured and delicate contribution and lending a sultriness which only adds to the allure of the album. Rome is a hugely successful and cohesive record – which will be a great relief to all concerned after a five year gestation period which saw vintage instruments and some of Morricone’s original collaborators assembled to lend authenticity to the process. It’s clearly been a labour of love and one which deserves to be lauded as a wonderful tribute to a rather than a hollow pastiche.